The key to eliminating fleas is vacuuming every other day, more if possible. 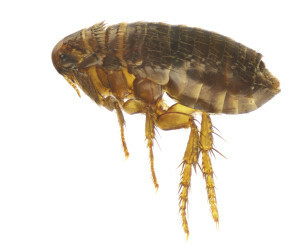 Fleas are drawn out of their pupae stage by vibration as well as carbon dioxide emissions. Any animals living in the home must be treated with a flea bath and, preferably, Advantage or Revolution, available at a veterinarian’s office. Both of these treatments contain an insect growth regulator, or IGR, which, essentially, keeps the flea in whatever stage they are in when they come into contact with the IGR. They will never mature into adult fleas. The adults will be taken care of by the flea bath or by the residual treatment. Residual treatment includes all floor space and 18” up the walls, including baseboards, as they are a favourite hiding spot of fleas and larvae. Window sills are treated if cats are or have been present in the structure.